We are reckoned organization of this domain engaged in offering an enhanced quality Fancy Paddy Ornament. Our prices are reasonable & merchandise is of good quality. The delivery of the goods will be on time. We are showing some Pictures of our products & we hope you will be interested in it. Designed using Paper, are the Christmas Tree Hanging Balls we offer. The quality and unique design of Christmas Tree Hanging offered by us equals international standards, thus providing complete satisfaction to the clients. We supply Christmas Tree Hanging Balls in an assortment of vibrant colors, sizes and unique designs. We offer our clients with excellent quality Fancy Necklace Set, which is extensively demanded by our clients across the globe. These sets are fabricated, using high grade metal alloy that is sourced from trusted vendors. Besides, these necklaces are ideal for various occasions like parties, marriages and many more. We are offering Christmas Hanging Ball to our clients. These Christmas Hanging Balls are available in various sizes and specifications. 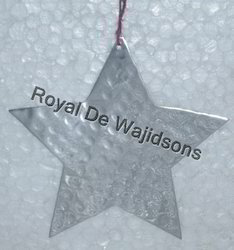 Our Christmas Hanging Balls can be customized as per our customers specifications and it can be availed at most reasonable price.